The outer fringe of the Roman Empire crossed the narrowest part of Britain just south of the Pictish lands, in today's northern England just south of the Scottish border. The Emperor Hadrian commanded the construction of a wall across this narrow point of Britain starting in 122 CE. Today's Britain was Roman Britannia, but only up to the point where the Roman legions could beat back the Picts coming south out of Scotland. The Emperor Hadrian had his wall built from coast to coast to fortify his northern border. The massive construction project took six years, 122-128 AD, and involved the moving of an estimated 2,000,000 cubic yards of earth. This was the largest engineering project undertaken by the Romans. There was a gate every Roman mile (1480 meters, or 0.9196 statue miles). A small fort called a milecastle guarded the gate. Then between each pair of milecastles were two observation turrets — there was an outpost every 494 meters, at least on average. The practical implementation shifted the milecastles up to 200 meters either direction to better utilize features of the landscape or to support visual signaling to the Stanegate series of forts to the south of the wall. Larger forts like Vercovicium were widely spaced along the wall, on its south side or up to a few hundred meters to its south. The wall itself was constructed from locally available material — squared stone east of the River Irthing and turf to its west. The stone section would be three meters wide and five to six meters tall. The turf section would be six meters wide and 3.5 meters tall. On the north side of the wall would be first a ditch and then a berm, at least in the places where the local topology supported this cross-section. 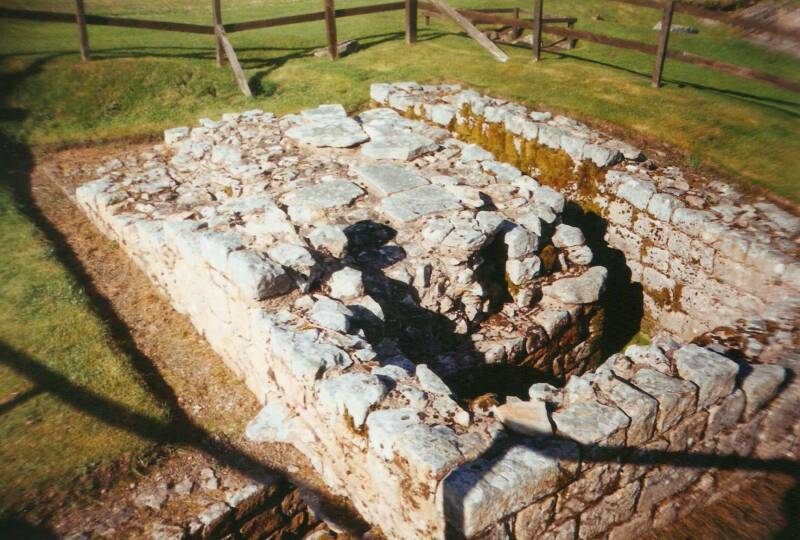 Here you see the Imperial Roman toilets at Vercovicium Fort, a part of Hadrian's Wall in Northumberland, England. Three Roman legions were involved in the construction: the Second, Sixth and Twentieth Legions. They left their inscriptions in the turrets and milecastles, and this shows that the three legions each used their own unique designs. Very similar, but noticeably different. 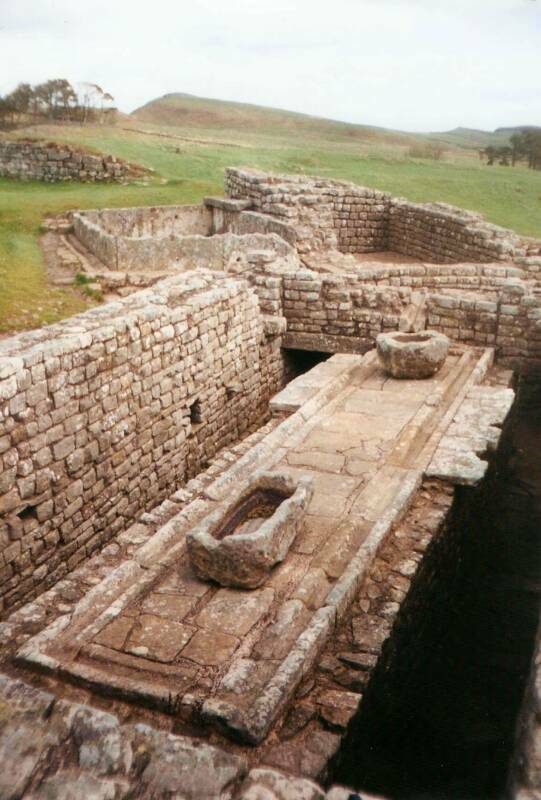 These Imperial Roman toilets are at Vercovicium Fort, now known by the modern English name of Housesteads Roman Fort. It is between milecastles 36 and 37 along Hadrian's Wall. These are the latrines for the fort's military garrison. Vercovicium was garrisoned by a double-sized auxilliary infantry cohort plus a detachment of legionaries from Legio II Augusta. Somewhere in the early 400s the Roman administration faded away and the communities along the wall either became fully self-sustaining or faded away. They hadn't really been all that "Roman" for some time, with the military and administrators recruited locally for many generations. 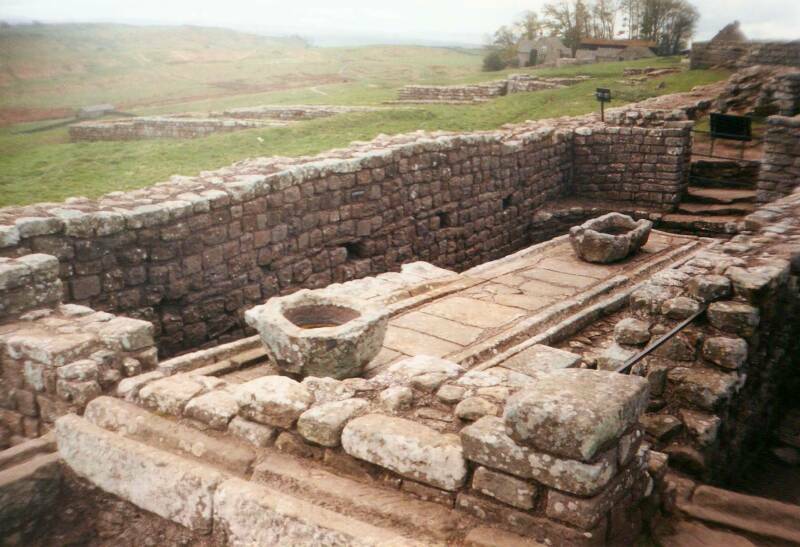 More Roman plumbing can be seen at Vindolanda Fort, an auxilliary fort or castrum a short distance south of Vercovicium guarding the Stanegate road from the Solway Firth to the mouth of the River Tyne. These are at the public baths. This indicates that the Fourth Cohort of Gauls really contained native Gauls who wanted to distinguish themselves from the local British recruits. 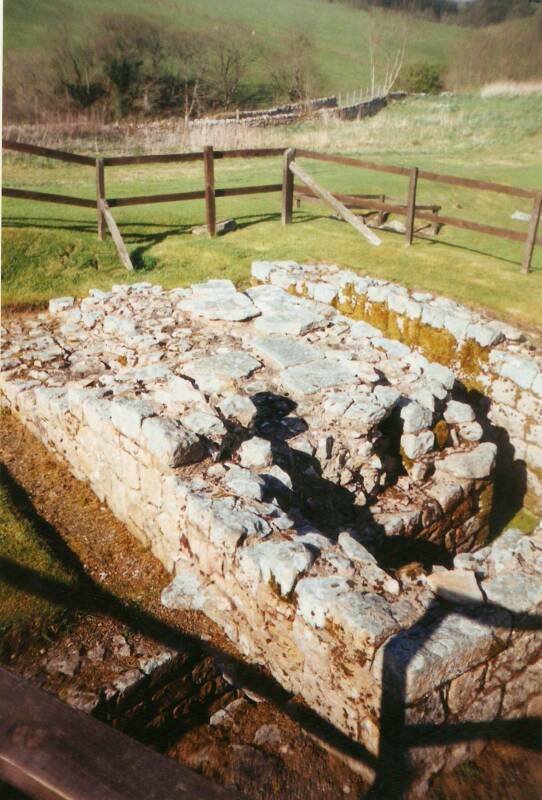 The ruins of Vindolanda were occupied for several centuries after the gradual departure (or assimilation) of the Romans. 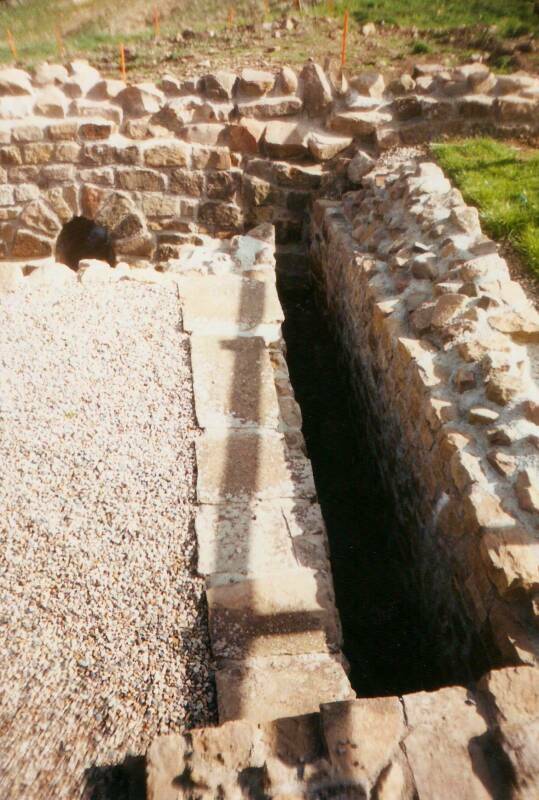 In 1973, the Vindolanda Tablets were discovered. They are the oldest surviving handwritten documents found in Britain, and provide the best view of life along Hadrian's Wall. They are the earliest known examples of the use of Roman ink writing. They date to the 1st and 2nd centuries AD, showing that there was a high degree of literacy in the Roman army and revealing details of the professional and personal lives of the administrators. 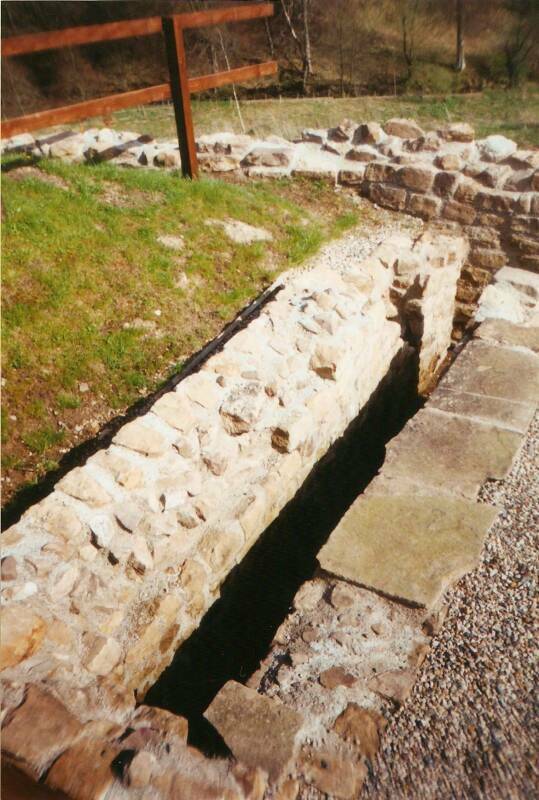 There are official notes about Vindolanda fort business, and personal notes from the officers and their households. The largest single group of tablets is the correspondence of the prefect of the 9th Cohort of Batavians, Falvius Cerialis, and of his wife, Sulpicia Lepidina. George R. R. Martin has acknowledged that A Song of Fire and Ice, basis for the mini-series A Game of Thrones, was inspired by Hadrian's Wall. I doubt that anyone was surprised to learn this.